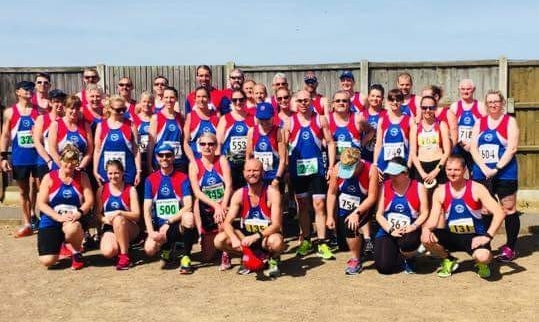 The popular annual 10k hosted by Great Yarmouth & District Athletics Club boasted its first ever sell out race with all 800 places being filled before the day. This led race director, Pat Brightman, to take the decision to start the competitors in three different waves to ease congestion. Finishing positions were decided on the chip times of all the competitors to make it fair for the 682 finishers. Spread across all three waves were 44 members from Great Yarmouth Road Runners (GYRR). This race is typically a hot one and the 2018 race was no exception. The water stops were welcomed at 3k and 7k as temperatures soared to an uncomfortable level for racing. Freethorpe and the surrounding villages make for an undulating but picturesque route. The race was well supported with plenty of encouragement from the marshals. This race was designated as the Norfolk County Champs 10k and as the 6th out of the 11 Grand Prix races for the 2018 season. With many of the GYRR members in a top 20 Grand Prix position it was essential to finish as highly as possible in each age category to add to their accumulative points total. Carole Spong put in a strong performance to finish in 1st place in her age group. Andrew Dormer is experiencing a gold rush of form this year. His new personal best (PB) of 40.18 also earned him his 6th run at gold standard for the club this season. This is a great achievement and shows consistency at a high standard. He will now be aiming for that illusive sub 40-minute barrier. Kevin Fuller was also delighted to knock 30 seconds off his best to earn a new PB of 44.34. Club coach, Andrew Baker, ran a solid race in 42.02 which was close to his PB. After a long-term injury, he has shown great determination to keep fit by doing a lot of cross training in the form of swimming and cycling. Marc Evans 38.14, Andrew Dormer 40.18, James Carass 41.02, Simon Bekker 41.59, Andrew Baker 42.02, Terry Hubbard 42.06, Mark Stone 44,15, Kevin Fuller 44.34, Gary Pillar 44.43, Penny Studley 45.09, Andrew Thomas 45,16, Nicola Baker 47.11, Paul Reeve 47.27, Mark Ollett 47.30, Sean Jermy 49.06, John Algar 49.25, Lorrain Dawson 53.24, Darren Adams 55,27, Rob Bailey 56.44, Kelly Shaw 57.04, Nicola McGee 57.05, Gemma Aylen 57.12, Ivan Lees 57.58, Steph Deeks 59.47, Rachel Ollett 59.58, Carole Spong 1.00.53, Liz Cox 1.03.05, Hannah Martins 1.03.56, Bridget Inyang 1.04.22, Rachel Acamon-Carbonelli 1.05, Linda Carter 1.06.25, Rochine Symonds 1.07.37, Vikki Brownsell 1.07.55, Naomi Hills 1.10.45, Jo Pinkney 1.11.46, Leigh Taylor 1.15.01, Bob Arnell 1.17.02, Anita Betts 1.18.11, Katherine Audus 1.19.50, Alison Bilyard 1.19.51, Joanne Stone 1.20.38, Maxine Hart 1.20.38, Jim Spong 1.29.01, Chuck Weigand 1.29.02.